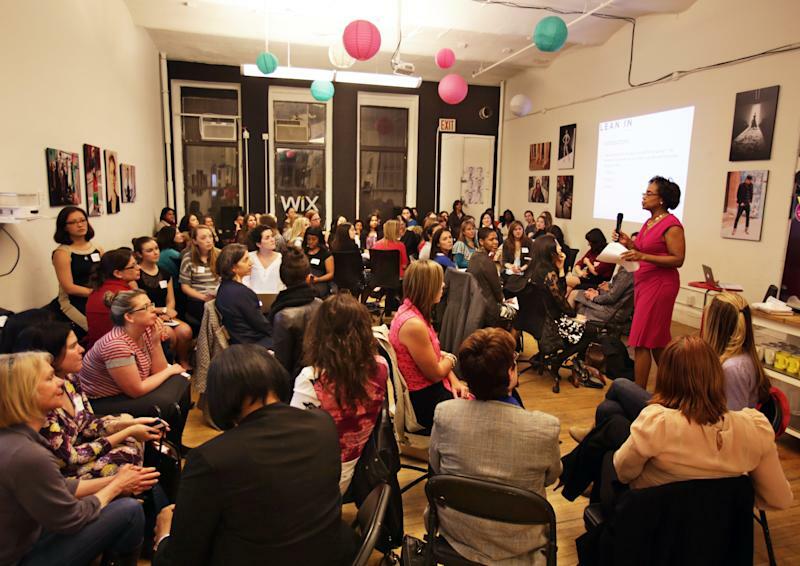 NEW YORK (AP) — "Remember — you are your own brand," business coach Franne McNeal was telling some 100 women crowded into a downtown Manhattan office lounge one evening last week. "If you lean back, you are denying the universe your greatness. So lean in, shout out, and get comfortable with who you are! Tonight is about teamwork." Sheryl Sandberg, the Facebook chief operating officer whose best-selling book, "Lean In," inspired the meeting, would surely have been happy with the turnout. Her book, and the national discussion it seeks to launch, is aimed at helping women empower themselves in the workplace. On its final page, it suggests forming small circles to continue the conversation. The idea is about 10 people per group, but more than 10 times that number showed up last Tuesday in response to an open invitation on LinkedIn from Mary Dove, a New York psychotherapist. "Do we do ANYTHING small here in New York?" Dove asked the crowd with a smile. Many, though not all, the attendees had read "Lean In," which came out last month to a burst of publicity, blockbuster sales — and much controversy. Was Sandberg, as some of the negative reviewers asserted, essentially putting the blame on women for their inability to fully crack the glass ceiling? Was she giving a pass to government and employers, and instead firing, as one USA Today columnist wrote, the "latest salvo in the war on moms?" Not surprisingly, the women at the New York meeting were fans of the book, saying that in Sandberg's anecdotes they'd found much to recognize from their own lives — especially instances when they "leaned back." Lauren Tilstra, 27, had just read the book on a beach in Latin America, during a break between jobs. In an interview, she recalled that at her previous job, when her boss and mentor left, she realized she wasn't getting a seat at the table anymore — and wasn't being aggressive about claiming one. "I was being left out of conversations," says Tilstra, of Hoboken, N.J. "I was kind of leaning back, and not getting into things that were going on. That's when I realized I had to find somewhere I could lean in." At her new job, which she began just this week, she hopes to gain a leadership role and build her own team. Tilstra was happy for the chance to share her thoughts at the Lean In circle last week. After an opening talk, the facilitator, McNeal, organized the group into smaller circles, based geographically to make monthly meetings easier. "It's a unique group of women," Tilstra says. "These are women I never would have come across in my day-to day life." Her group plans to rotate between homes in New Jersey, much like a book club. Which is exactly how Rachel Thomas, co-founder and president of LeanIn.org, describes the circles: "A book club with a purpose." "It's all about practical support," says Thomas, whose foundation is based in Palo Alto, Calif. "The goal is to help women put the ideas of Sheryl's book into practice." To that end, the foundation has extensive content on its website (proceeds from Sandberg's book, Thomas says, go to the foundation) including videos, produced with the Clayman Institute for Gender Research at Stanford, exploring issues like how to negotiate — a thorny issue for many women — and how to use better body language. There are also detailed kits for Lean In circles. Of course, the big question is how many of these circles are forming. Thomas doesn't have an answer, partly because the groups don't need to report back to her foundation. "We think they're just sprouting up organically," Thomas says. She says she's heard from women as far off as India, Britain and Australia; one woman at a mining company in northeastern Canada wanted to participate remotely. But for many, it seems to be the element of personal contact that's most appealing. "It's like Girl Scouts for adults," says Linda Brandt, 43, who started a circle in Minneapolis, where she works in public health. Responding to a social network query, Brandt quickly amassed a group of 30, a combination of friends, professional acquaintances, the woman who watches her dog, a neighbor down the street, and people she's never met. The group is diverse in both age and economic background. Brandt hasn't read Sandberg's book yet, but she's watched her now-famous 2010 talk to the annual TED conference that went viral. She especially likes one of Sandberg's best-known lines: "Don't leave before you leave." In other words: Push as hard as you can in your career until you HAVE to leave to have a baby, so that you have something compelling to come back to; don't opt out in mere anticipation of having to later. "Nobody's ever said that in such a clear way," Brandt says. Another of Sandberg's themes is the so-called impostor syndrome — women negating their own self-worth to the point of feeling like their success is fraudulent. That rings particularly true to Bridgid Kinney, who works as a division manager of a small business in Columbia, Mo., and hosted her first Lean In circle Monday night. The realization that she was underselling herself came home to Kinney, 38, in a previous job, when her business partner — who was her husband at the time — left the company, and she didn't want her customers to know for months, for fear they'd think she couldn't handle things herself. She's learning not to underestimate herself like that. In her circle, everyone articulated three career goals. "We're looking to take greater career risks. We want to make some changes. And we're looking for a sense of camaraderie and support," she says. 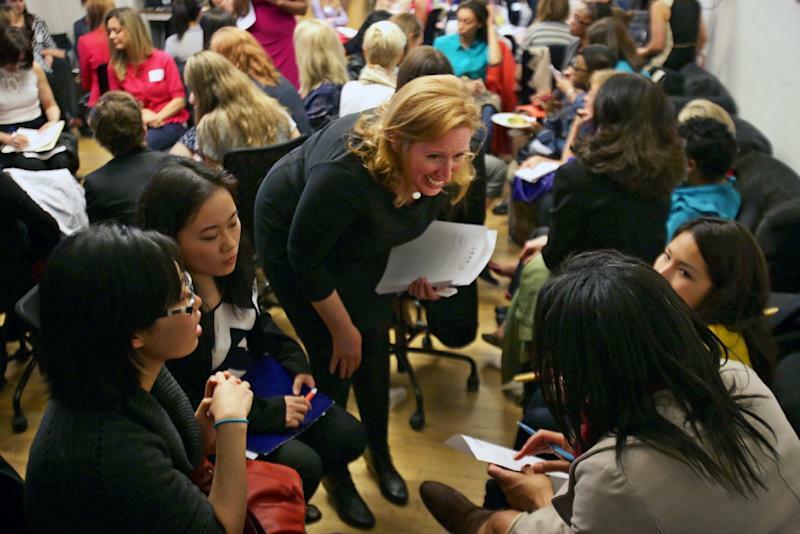 While the Lean In groups seem to skew toward women in their 20s and 30s, there's certainly a range. In Tulsa, Okla., Dorothy Minor, 66, has started a circle at the community college where she teaches. "There are eight of us, 26 and up," Minor says. For the older employees, there are issues of transition and retirement. And the younger ones "can benefit from our collective wisdom," she says. "It just seemed like a great way to get together and talk things out." Talking is, of course, essential, but only to a point: In New York, the groups were urged to keep things moving fast, and long monologues were discouraged. 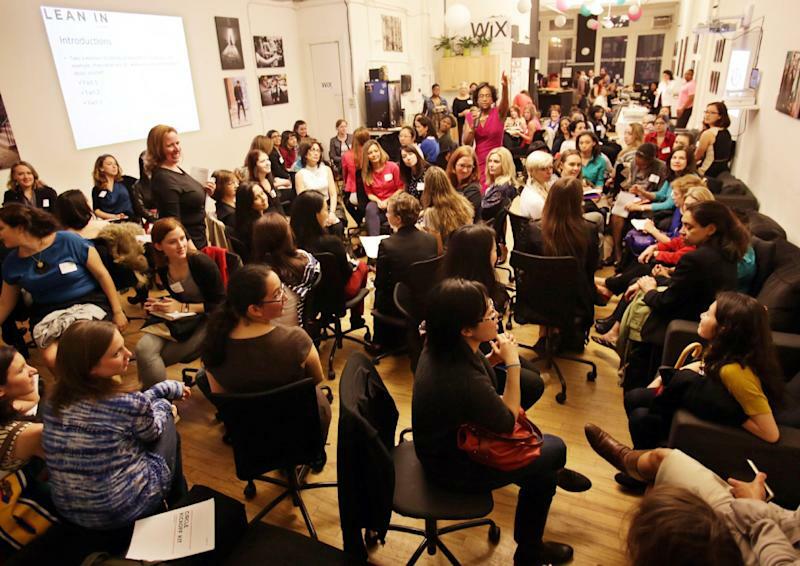 The group from Brooklyn was big — so big that members dubbed it "A Circle Grows in Brooklyn." Melissa Lloyd, 33, found herself in the South Brooklyn spinoff. "We were really different, but all kind of facing the same quandaries," Lloyd says. "Work-life balance, and how to negotiate for what we're worth." "I am from the South, and we're taught there to be sweet and polite," adds Lloyd, who runs her own consulting firm. "I've had to learn to say, 'No, I am worth more,' rather than, 'This is the best I can do.'" For Anne Fitzgerald, the evening was fruitful if not perfect. She found her group younger than her — she is 43, Sandberg's age. "I don't know if I want to be surrounded by 20-somethings," she says. "I'm not looking to be a mother hen." But she adds: "I didn't walk away disappointed." Fitzgerald is interested in what Sandberg calls the success and likeability problem: As women become more successful, they are less liked. As a real estate agent, she's found she's had to be aggressive to compete — but then risked being unlikeable. "This is true in every facet of women's lives," Fitzgerald notes — not just at work. "We don't want to be assertive." And so, she thinks, the Lean In circle might involve some overall life lessons as well. Tilstra, the New Jersey woman, agrees. After the meeting, she and a friend debriefed each other at a Mexican restaurant. They both felt it was going to be great to have a sounding board. "You can't always trust people at work, and it's nice not to have to complain to your significant other," Tilstra says. Besides, she adds: "Everybody can use a little therapy."